Its hard enough to have one successful career. Having the strength to call time on it and start from scratch seems like self-sabotage. In Kate McGill and Dan Broadley's case however, it looks like it's going to pay off. Their early years – while exciting and substantial – now look like practice for the main event. The moment it was all building up to? Meeting each other and forming Meadowlark. Prior to the band, Kate had clocked up tens of millions of views on YouTube for her catalogue of covers. She eleased an album, had tracks played on Radio 2, and spent a summer in Los Angeles writing with various renowned hitmakers. Dan, meanwhile, was playing in various rock bands and earning a reputation as a great director having made videos with the likes of Don Broco, Lower Than Atlantis and Mallory Knox. But Kate was feeling drastically unfulfilled, worried she was only going to be known for covering other people's songs when she had so many of her own waiting for an audience. Dan, meanwhile, musical tastes changing and growing all the time, was lumbered with bandmates that would neither shift their focus or gig further than 10 miles from home. Something had to give. 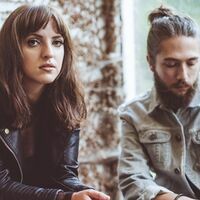 With both Dan and Kate hailing from Plymouth, a town with a relatively small music scene, it's little surprise they already knew of each other. Now living in Bristol, Kate speculatively contacted Dan wondering if he might be interested in collaborating. Sure enough he was, and soon after she was driving down to the south coast, where, after drinking a fair amount of wine to calm her nerves, they started jamming. A matter of weeks after deciding they were a band – albeit a band without a name, finished songs or any recordings – they were asked to support Bastille. Suddenly the vague sketches of songs they'd created needed to be finished, and they had to find a name. First things first Kate scoured every book she could find looking for inspiration, and stumbled across Meadowlark. It seemed a good fit. After all, meadowlarks are known for their song, and Fleet Foxes, a huge influence, have a song of the same name. Still toying with the idea, good old-fashioned serendipity stepped in. After Kate announced she was quitting her YouTube career with an impulsive Facebook post, one fan, among many of her hundreds of thousands of subscribers, replied with a link to a video to wish her well. Amazingly, despite the fact she'd told no one about the band name she was eyeing up, it was simply screengrabs of Kate cut with video a meadowlark in flight. Spooky, perhaps, but it was more than enough to seal the band's name. Off stage, their track ‘Eyes Wide’ was added to BBC Radio 1's Introducing playlist, XFM's evening playlist and featured on Hype Machine's Top 20. They've also performed a session on Dermot O'Leary's BBC Radio2 show, played Glastonbury's Introducing stage, at the Great Escape, MAMA festival in Paris, Dot to Dot, and appeared on episodes of Vampire Diaries and Made in Chelsea. Musically, their sound has simplified since those first writing sessions. They&'re still exploring the space where folk and electronica meet, and while getting ever closer to the sound in their heads, one of the most important lessons Kate and Dan have learned is that less can be more. Another, perhaps above all else, is that ego should be left at the door – the song is always the most important thing. "We've got a really good thing going, and it's completely shared understanding of what we want to do," says Dan. "If a song just needs Kate's voice and a piano, I will happily step aside and let that be, just as Kate will make room for me if it that's what is needed. We think solely about the song and nothing else, we're not precious."